World, meet Percie - a gorgeous young pup who has her heart set on becoming a certified medical alert dog. But that won't be her only accolade. She's probably the happiest golden retriever to ever grace the earth. Percie began her 18-month journey to become a service dog last September, under the guidance of her owner, Claire. When she was a little younger, Percie had to part from her to undergo some formal training. 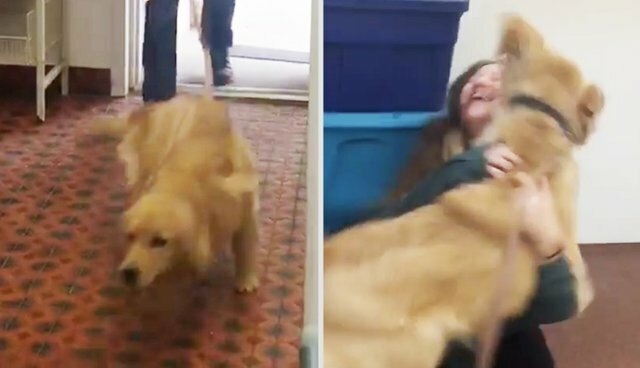 It's unclear just how long she was away - but based on Percie's reaction to their sweet reunion, caught on video, in her mind it's been forever. While it is clear that Percie really, really loves her mom, Claire hopes all the care and affection in her heart will benefit others who need it most. "Dogs teach us that love can always be given, and can always be received, no matter how difficult the circumstances," Claire wrote on a GoFundMe page to help pay for Percie's training. "And I want to share that knowledge with as many people as possible." Click here to follow Percie's progress on Instagram.